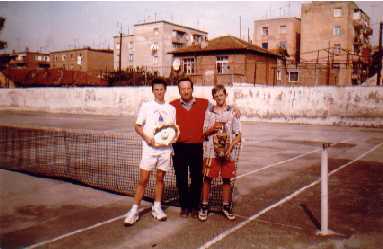 Photo from Tirana Tennis Club. 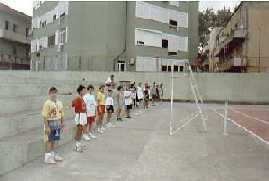 Children in a normal training. Photo from the club, with Mr. Luca Santilli, employee of ITF in an official visit in Tirana. 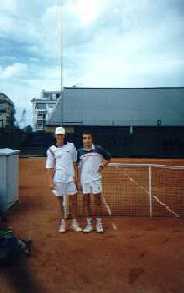 In the left is a photo of Almed Sojati, national champion in 1997, in a tournament in Luxembourg. 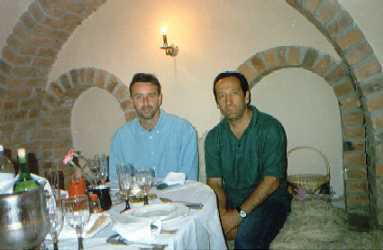 Above is a photo of Mr.Dave Mailey, one of the leaders of ITF, with President Voshtina (in the right). Mr.Mailey came in Albania to enquire about the situation of tennis. 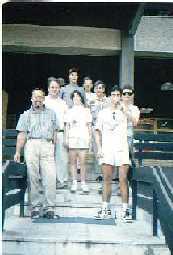 Above is the photo of the final match of the National Championships under 16 in 1998. In the left is the winner, Penar Musaraj, and in the right is the 2nd place winner, Grid Voshtina. The President is in the middle, congratulating both players. Above there is a photo of the National team under 16, together with the President, Mr. Voshtina, and the former Gen. Sec. 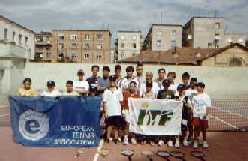 Mr Llazani, in a tournament in Macedonia.